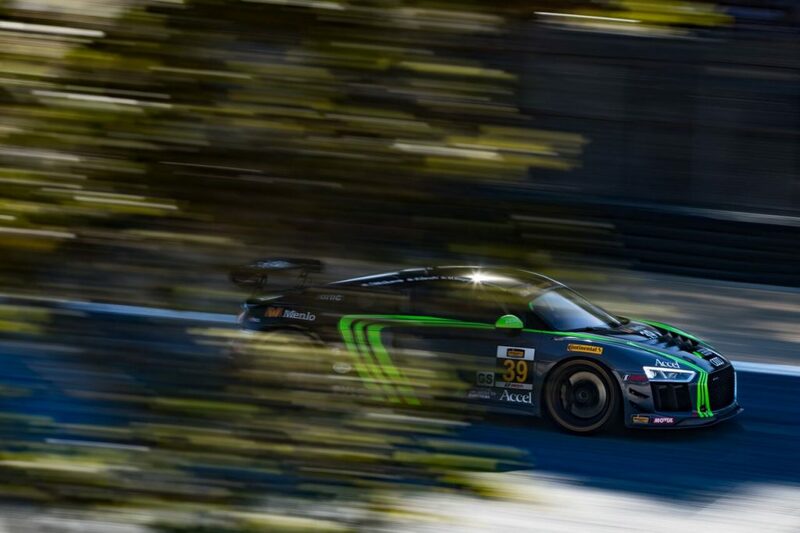 For Immediate Release- Round 9 of the IMSA Continental Tire Sports Car Challenge was the series only west coast event, at WeatherTech Raceway Laguna Seca. This would also be the Home race for Carbahn & Peregrine Racing, as well as Drivers Jeff Westphal and Tyler Mcquarrie. The 2.2 Mile road course is one of the North American Jewels, rich with racing history over the years. Just 5 miles from downtown Monterey, the track is built on rolling hills with marine type topography, moisture in the air, and poor surface grip due to the near by ocean and resulting weather patterns. This typically makes for exciting racing, as the grip is a struggle indefinitely over the hour-long stint/fuel tank distance. 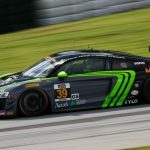 The #39 Audi R8 GT4 was coming into this event with something to prove after a strategic error and on track miscalculation caused the car to finish a difficult 12th place at Virginia International Raceway. 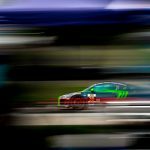 “You home race is always one you want to win, with family and friends out to watch, and the same from the owners, crew, team, there is a special buzz at home races with all that support. Especially after VIR where we all felt robbed. We had a quick car and the result wasn’t proportional to our effort, so I know everyone on the team is extra motivated.” Explained Westphal. 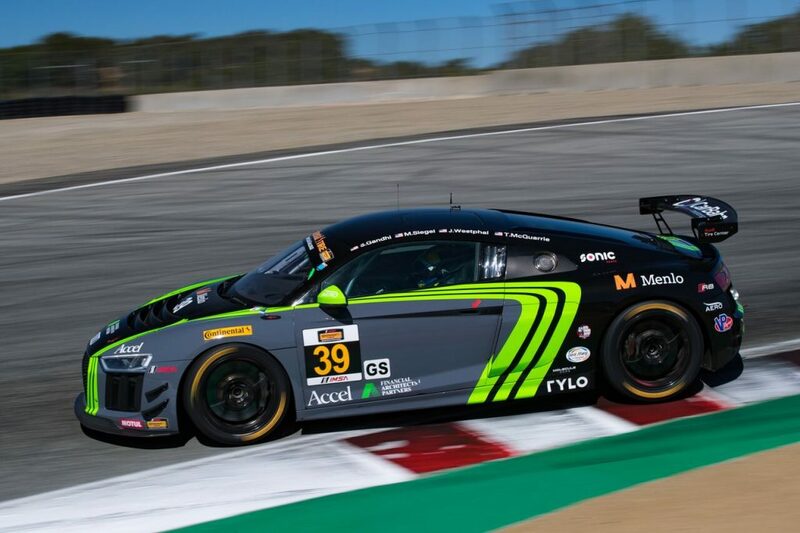 Tyler McQuarrie qualified the #39 Audi R8 GT4 3rd of 20+ entrants in GS, just .3 seconds off the pole lap from the #69 Mclaren 570 GT4 of 1.32.8. The start of the 2 hour endurance race would have the top 3 run single file and pull away from the pack, with P4 #46 AMG GTS roughly 4-6 seconds back from the top 3 cars during the first 40 minutes. Shortly after, a yellow flag (safety car) period came neutralizing any track position advantage anyone had gained, however the minimum drive time wasn’t achieved yet, so the #39 and others stayed out as part of the strategy to make the race a 1 stop event. Others stopped under yellow to put fuel in the car (the longest of the processes on pitlane), and opt to change only the driver and tires and handful of laps later for a shorter, second stop. The #39 stayed out until the track went green again, and ran a handful of laps light on fuel with old tires, while two other strategies were playing out behind Mcquarrie. The car stopped for the service and regained the track in 12th position, with 55 minutes to go and Westphal now behind the wheel. Jeff ran consecutive quickest laps on track with current conditions (not best of the race due to track degradation) which allowed him to track down and pass numerous cars ahead, ultimately leading him to the white flag lap in 6th position, with the #7 Ford in sight just a few car lengths ahead. Westphal exited turn 2 right behind the Mustang GT4 which caused Trent Hindman to go defensive into turn 3. This move protected Trent from being passed into turn 3, so Westphal darted out left to open up his radius of turn 3, rotated the car on the brake pedal, and squared up the exit to get side by side with the #7 in a drag race toward turn 4. Since Westphal had effectively used Hindman’s move against him on the exit, Westphal had the inside heading into turn 4 and successfully took the position. Westphal led the now rebuttaling Ford Mustang GT4 into turn 5 where someone had brought dirt onto the circuit, so a last minute adjustment of speed and line allowed Westphal to go unchallenged into turn 6. As the two raced down the corkscrew roughly 3 car lengths apart, the 3rd placed Porsche Cayman GT4 #28 was running out of fuel in turn 10 and coasting into the last corner. 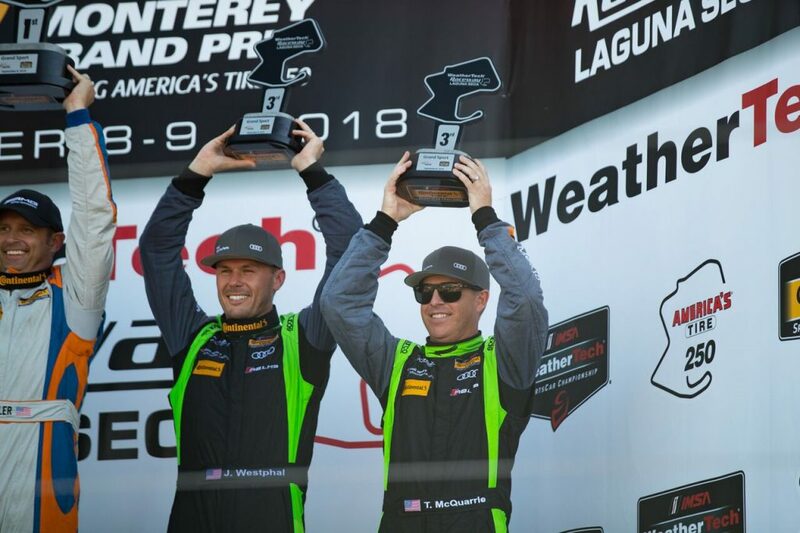 Westphal exited the last corner wide, with two wheels kissing the dirt and slicing past the coasting #28 Porsche to inherit 3rd place and score the team’s first podium of the season. “What a race, complete effort from everyone here, Tyler with a great opening stint to protect the car and track position, the engineers for setting up the car to protect the tires over the hour run, and the strategy call to allow me no worries on fuel. It’s a great feeling to finally stand on the podium and celebrate, a place we feel we could’ve been a few times this year!” Elated Westphal.